Hi everyone! Today I am happy to link up with Speech Peeps for her Speachy Feedback Linky Party! 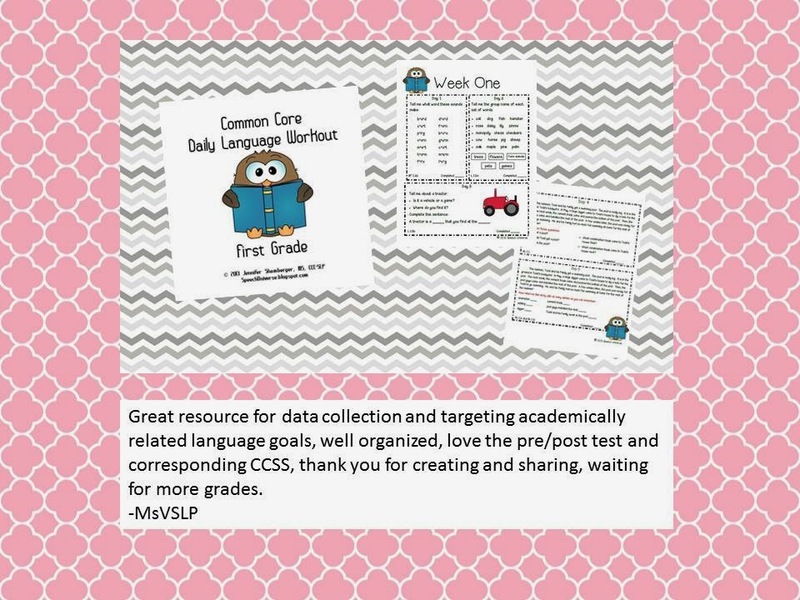 This is a fun link up where speechies with TpT stores link up and celebrate great feedback that has been left by offering a free item from their stores. The feedback section on TpT looks a little different now. When you scroll through, you can now see the number of stars in each area of feedback. This gives buyers and sellers more insight into products. So, here it is, the Speachy Feedback Linky Party! You can click on the picture above to find all of the TpT stores that have participated in this linky party. If you have left feedback on any TpT products, click through the links to see if you have won a free product on any of the blogs! 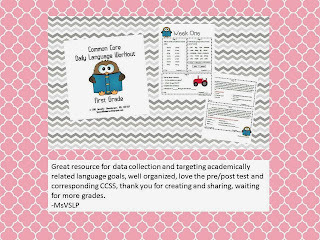 MsVSLP left me some great feedback about my First Grade Common Core Daily Language Workout. I spent a lot of time making this product, and it made my day to get great feedback that she appreciated the content. On a side note, I am making more grades, just need to carve out some time. Thanks everyone for leaving feedback on items you have purchased, or on freebies! It always makes me smile to know that people enjoy items that I am making. I also love to hear ways that you use items or things that would make them even better. Make sure you check back here next month, and keep leaving feedback...I might pick you next month! I tried to follow the links to see what this was about, but it kept wanting to take me to Pinterest, which did not seem right, or is it? I had that problem too when I clicked on the icons. When I clicked on the bloggers names, I was able to go to the links.